Today I am going to talk all about my experience as a member of my law school Moot Court team throughout my 2L year. Spoiler alert, it was the best experience and I loved it. It challenged me and pushed me out of my comfort zone but in the best possible way. 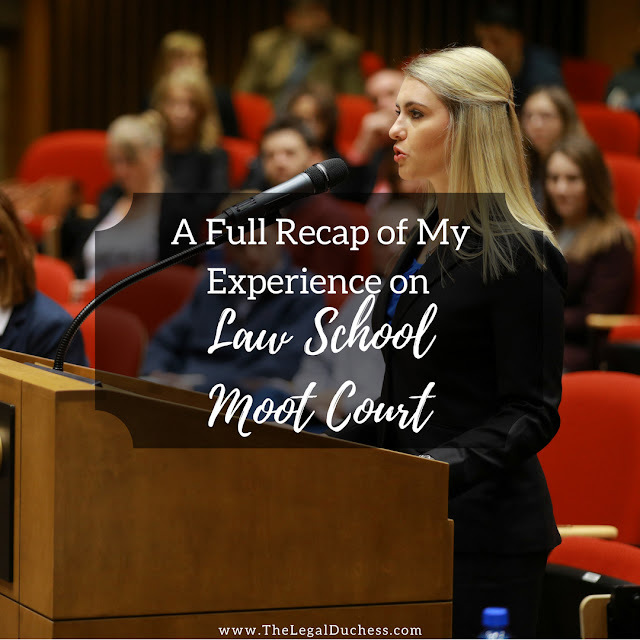 For those wanting to work in a courtroom and do litigation at some point in their law career, the experience you gain in Moot Court is invaluable (or at least it was at my school). I can't speak to how Moot Court works at every school but hopefully, there are enough similarities for this to be helpful to a variety of people. Why Moot Court and not Law Review? So I know everyone and their brother will tell you that you have to do law review in order to get good jobs out of law school. I disagree- if you want to work in a firm, shoot for law review; if you want to do public interest or criminal work, Moot Court or Mock Trial is probably better experience (disclosure: I am not an expert and I may be wrong but based on my experiences and in talking with employer's, this is my understanding). At my school, Moot Court try-outs take place at the end of 1L year- after you turn in your appellate brief but before exams. The try-out consisted of a 5-minute oral argument based on your issue from the appellate brief. They also asked for a copy of your appellate brief to review your writing and a small questionnaire. The Moot Court board offered practice sessions before try-outs so I did one of those to get my jitters under control. It went well despite the fact that I had a cold and sounded like a dying frog. My try-out was on a Sunday so I dressed in my full suit and headed in with just a small argument written out of a file folder. My try-out argument was pretty quick and painless and I felt good about it. I tried to put it out of my mind and focus on upcoming Spring final exams at that point. In mid-July, I received an email letting me know I had been selected as a Moot Court competitor for the Products Liability team. Out of our whole 1L class, only like 6-7 people were selected so I felt pretty proud of myself. At my law school, participating in Moot Court has three main components: compete in the Interscholastic Oral Advocacy competition in the Fall semester, take an Appellate Procedure Writing Seminar in the Fall semester and compete in a national competition in the Spring semester. The first thing I did was the Interscholastic Oral Advocacy Competition. This was a head to head competition just for 2L students at our school. It was a ton of work with weekly arguments to prep for. I was blessed enough to make it to the final four competitors and the final four presents arguments in front of three federal judges in front of the whole school. Talk about nerve-wracking! However, I survived and it was such a great learning experience and helped me to grow my confidence as a public speaker and oral advocate. My competition was in March of Spring Semester. I was on the Products Liability team and we would be traveling to Cincinnati, Ohio for our competition. My partner was a fellow 2L and we really had a great time working together. A good partner makes Moot Court SO much easier and more enjoyable. The first thing due was the appellate brief. The competition released the problem in January and we had 2-3 weeks to research it out and write the brief. There were two distinct issues so my partner took one and I took the other. The case had to do with an exploding EZ-Bake oven which injured a child. My partner and I were both pretty on our game with getting the brief done on time and doing a lot of editing to turn in the best product we could. Finally, we sent the brief off to be judged and got started on oral argument practice. Our team was assigned a faculty coach- ours was one of the school's Torts professors and she was so fantastic to work with. We wanted to get 10 practices in before our competition which worked out to almost every day for 2 weeks, sometimes twice a day. Our practices had a panel of 2-3 professors who were our "judges". You never know what kind of judges you will get; sometimes it's a hot bench (asks a lot of questions) and sometimes it is a cold bench (asks almost no questions). Our professors tried to replicate every possible scenario so we would be prepared. Some practices we barely got our arguments in because there were non-stop questions and others we had a silent bench and it felt like there were crickets in the room. For our competition, we would be asked to argue both petitioner and respondent of both issues so there was a lot of argument to prepare and practice. It was an exhausting two weeks... some of our practices were after night class so we would not leave the school until 10pm. However, by the time we left for our competition, we were feeling pretty prepared. Our competition started on a Friday so we drove to Cincinnati on a Thursday afternoon after class. The school rented us a car (my coach, partner and I) so we had a pretty fun time on the drive down listening to White Stripes and talking about law school from a professors perspective. We stayed in a fancy hotel in downtown Cincinnati so we could walk to the Courthouses where the competition would be held the next day. It was actually the first time I had ever stayed in a hotel room by myself (I previously have always traveled with family or my husband) so that was some #adulting. We were the first team to arrive to the courthouse the next day after a quick Starbucks breakfast. It was at this point that my partner and I started to nervously pace up and down the hallways reciting our arguments to ourselves.... people probably thought we were nuts. We would have 3 rounds of arguments throughout the day. Our first argument went well- we had a pretty cold bench so it went by very slowly. We were happy with our performance. We went and had a quick lunch before our next argument which we would have to switch sides for... that was stressful. Our second argument was really strong and went a touch better than the first and we hade a boiling hot bench full of questions. By our third argument rounds, we were absolutely exhausted and ready to be done. Our final argument was actually our best and we left the courtroom feeling satisfied and proud of the work we did. That night, the competition put on a banquet for all competitors. It was a really fun night and we got to know a bunch of other law students. Unfortunately, we did not make it on to the final rounds the following day but regardless, we were proud of our performance. Overall, I would redo my whole Moot Court experience in a heartbeat. It was not always easy but the experience pushed me to be better. I learned so much about the law, oral advocacy, writing and courtroom etiquette. I have never been a strong public speaker but throughout this experience, I have been able to mostly get over that and become confident in front of a podium. I am so glad I was able to be a part of Moot Court during my 2L year; I learned, I made some great friends and had fun along the way. The experience will also look great on my resume and hopefully help me to stand out in the job search. Moving forward, I will be coordinating the Interscholastic Oral Advocacy Competition this coming Fall for the rising 2L's. I will also compete again as a part of the Labor and Employment Law Team and I will get to travel to New York City for that competition. I am really looking forward to a great 3L year and more fun to be had as a Moot Court competitor. If anyone is interested in Moot Court, I highly suggest the experience.